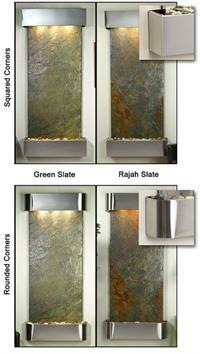 Choose from three styles of stone, either squared or rounded corners, and LED or Halogen lighting. Please make selections in menu boxes above. 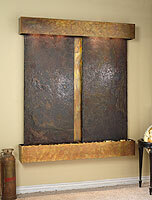 You may also choose to add a logo to your fountain. The fountain comes with a 6' long power cord, as well as a hidden pull chain that allows you to control the fountain without touching the cord. This fountain also features a dimmer switch. Finally, this fountain has an optional LED lighting system upgrade, featuring 32 different colors including white. Set it to display one or multiple colors. It also has a strobe function. 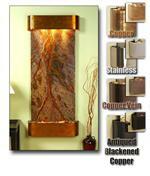 These lights last longer, burn cooler, and use less electricity than conventional halogens. That means less water will evaporate over time due to high heat. Manage all of this from the touch of a remote controller. Its a great idea for bars, nightclubs, and lounge settings.